Drum Corps International is pleased to announce its premiere edition of "The Beat," a brand new video magazine offered as part of the DCI Season Pass. "The Beat" gives you, the drum corps fan, exclusive inside access and behind-the-scenes insider information from every aspect of the Summer Music Games Tour. Hosted by veteran broadcast personality Steve Rondinaro, the show will be produced this season from four locations: Indianapolis, Ind., on July 8; San Antonio, Texas, on July 22; and Atlanta, Ga., on July 29. There will also be exclusive updates from Madison, Wisc., all week long during the week of the World Championships. "We are on the cutting edge of applications with television on the Internet," said host Steve Rondinaro. "This is another great tool to hook the fans up with the corps and the corps with the fans. 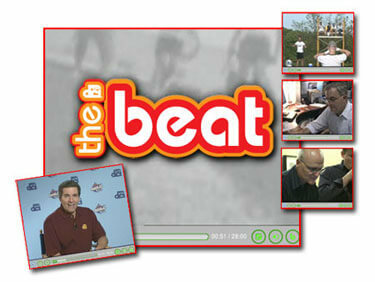 With 'The Beat,' we'll be able to go inside the season in a deeper and more timely way than we can on the once-a-year DCI World Championship television broadcast." In our premiere edition of "The Beat": Learn tips and tricks on how to run an ensemble rehearsal from the Madison Scouts. We chat candidly with the man in the "hot seat," DCI's executive director Dan Acheson, about ticketing and turf nightmares. Have you ever disagreed with the judges' picks? We get a judge-eye view from John Phillips, DCI's judge administrator. And we've got the scoop on the shows the Division I corps will be performing this summer.